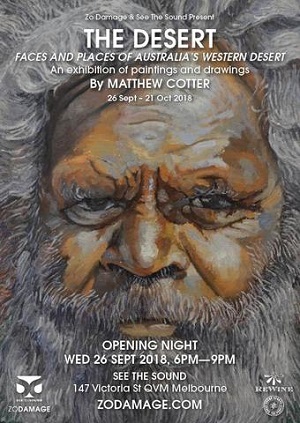 THE DESERT: Faces and places of Australia’s Western Desert is an exhibition of paintings and drawings by Even drummer Matthew Cotter. After attaining a Bachelor's Degree in Fine Art (Painting) from RMIT in 1992, Cotter pursued a career in commercial art-making for film and television for more than 20 years, working as a sculptor, props maker and scenic painter. Cotter returned to painting after accepting an invitation to live and work in remote indigenous communities with the painters of the Papunya Tula Artists group. Since 2013 he has spent over three years living in Kintore, Kiwirrkurra and Papunya working closely with such internationally renowned artists as Ronnie Tjampitjinpa, George Tjungurrayi, Warlimpirrnga Tjapaltrarri, and Yukultji Napangati. The paintings and drawings presented here are a purely aesthetic response to some of the more serene, majestic and otherwise interesting aspects of life with the Pintupi in Australia's Western Desert. THE DESERT opens Wednesday September 26 at See The Sound Gallery, run by renowned music photographer Zo Damage. Nestled in the heart of Queen Victoria Market Victoria St district, See The Sound celebrates Australian live music culture with Zo Damage photography, art by local touring musicians, Australian underground and independent vinyl releases and live music performance for See The Sound Market Sessions.